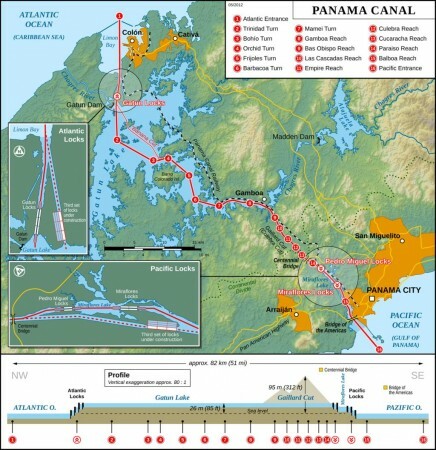 This year, ASCE’s National Conference became global in Panama City, home of the world’s famous Panama Canal. 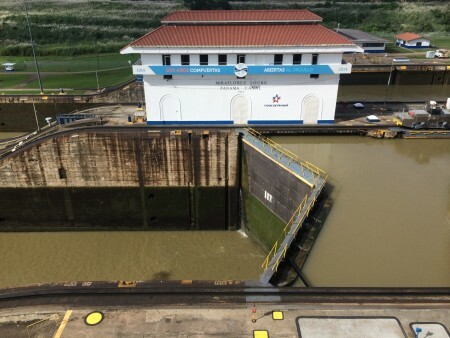 Nine student members from our chapter attended this unique celebration of the 100th anniversary of the Panama Canal. 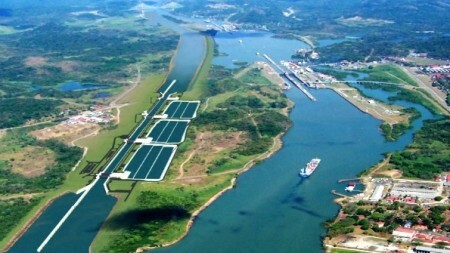 Technical tours were held for both the Pacific and Third Lane locks, in addition to the Gatun Lake. A special trip to the Smithsonian Tropical Research Institute was available as well. 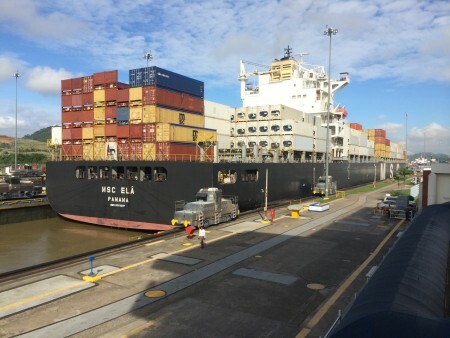 The conference included various concurrent sessions and mini general sessions amongst keynote speeches like the opening plenary session with keynote speaker, Jorge L. Quijano, Administrator of the Panama Canal Authority and Honor Conference Chair. Industry leader, Lieutenant General Thomas P. Bostick, Chief of Engineers and Commanding General, U.S. Army Corps of Engineers, spoke of the importance of civil engineering today. Although networking was a beneficial part of our trip, we had the opportunity to explore the foreign city and learn about its diverse culture. We traveled from Panama City to Casco Viejo, a historic landmark of Panama. We had the chance to venture into the dark and watery Bayano Cave, where screeching bats glided over our flashlights as we tiptoed deeper into the cavern. This was a unique opportunity to explore some of Panama’s natural wonders. 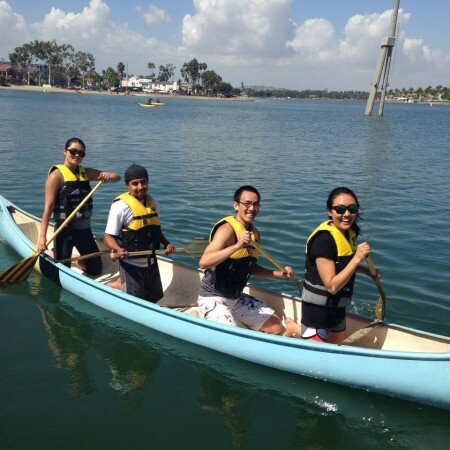 Every Saturday morning, the concrete canoe paddling team practices at Mother’s Beach in Long Beach. The team started practicing early this year in order to fully prepare for PSWC 2015 in Arizona. The team will also start practicing on Saturday and Sunday mornings during the second semester. There were a few returning paddlers but the majority of the team consisted of new club members. The returning paddlers, including Roman Ramos, Michael VanWagoner, and Tammy Takigawa, have been teaching the new paddlers how to turn around buoys, paddle straight, and steer the canoe. The team also hopes to learn a new paddling technique called draw stroking. Starting early in the year will allow us to improve our technique and learn from our mistakes. It will also give new members more time to practice and improve their paddling. Our goal this year is to finish in the top 7 schools for each race. The team bought new wooden paddles that are aimed at increasing efficiency in the water. The team hopes that underclassmen will get involved with paddling the canoe and return for the years after. We would like to thank Jess Daniel Gascon for helping the team transport the fiberglass canoe to the beach every week. We appreciate his dedication. 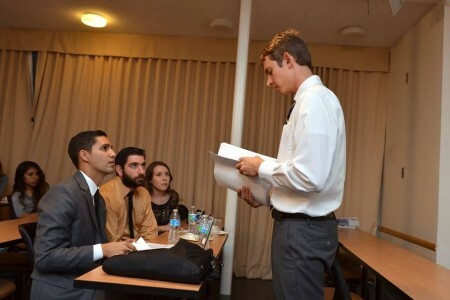 While our nine members represented Long Beach in Panama City, we held our third GBM on campus October 8th. Our faculty advisor, Dr. Redman, volunteered as our speaker. He informed the students the importance of passing the FE exam early in their college career. He also spoke about obtaining engineering license as a P.E., and how one should pursue in doing so. In our 4th GBM on October 22th, we were honored to have Jane Tran, President of LA YMF and representative from Hatch Mott MacDonald, as our speaker. After we announced our upcoming events, Jane took the stage and spoke about her transportation infrastructure projects she is currently working on, including CA High Speed Rail, and the LAX Modernization Project. She also mentioned the challenges she faced as a student in college and an employee at work. On Thursday, October 2nd, ASCE hosted a fundraiser at Veggie Grill. The event was very successful and we had several members come to this event. 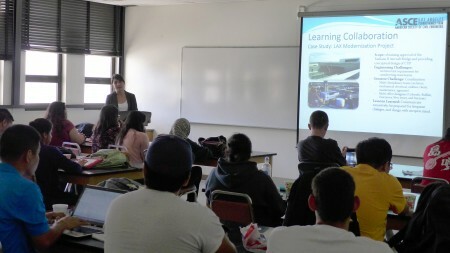 ASCE promoted this event for a week and reached out to other engineering organizations. The money will be spent towards the PSWC projects by providing the teams with much needed supplies. This fundraiser was organized by ASCE Fundraising Chair, Roy Perez. The event would not have been this successful without his hard work and commitment. On Wednesday, October 15th, our ASCE student chapter welcomed our recent graduates back to campus to speak in front of our members. They enlightened us with their new experience after graduation. They encouraged the audience to stay involved with ASCE. 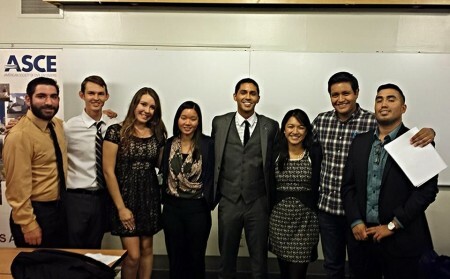 It is because of ASCE that they were able to obtain internships and gain access to job opportunities. The grads also advised members the importance of networking with professionals and keeping in contact with them. On Saturday, October 25th, ASCE and EERI (Earthquake Engineering Research Instituted) organized a fun park day at Marina Park in Long Beach. Park day had a large turnout and several new members came out to play, including freshmen and transfer students. Students played Frisbee, soccer, capture the flag and were treated to free food. Park day gave new members the opportunity to get more involved with the club and meet officers. One of the club’s goal is to get more people involved and increase the number of active members. ASCE activities chair, Caleb Shen, organized this social event. Park Day was the result of a successful collaboration between engineering organizations. 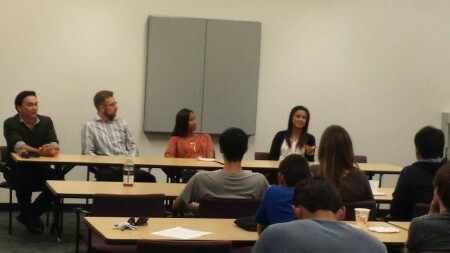 On October 17, Student Leader Mixer was hosted by LA YMF to teach student ASCE organizations about leadership skills. CSULB ASCE Co-President Victor Aguirre and Co-Conference Chairs Mais Sagradyan and Lauren Kilroy participated in this event and had the chance to meet with other schools and industry professionals. Victor, Mais and Lauren learned the skills and qualities that it takes to become a successful and leader. They also learned how to effectively run an engineering organization and gain the most benefits from constructive feedback.